The Airbus 330 Multi-Role Tanker Transport (MRTT) has already amassed 56,400 hours of flight, thanks to sustained operations over the Middle East by the first four customers. Eight more air forces have since selected the big Airbus twin, three of them in a European partnership. They will all benefit from a recently introduced upgrade for new-production A330 airliners, that Airbus Defence & Space will exploit during conversion of the ‘green’ airframes into MRTTs. The air forces of Australia, Saudi Arabia, the UAE and the UK have not only been refueling their own aircraft flying combat missions over Iraq, Syria and Yemen. Thanks to an emergency process named Clearance with Limited Evidence (CLE), these A330 MRTTs have also passed fuel from their wingpod hoses to French Rafales, American AV-8Bs and F-18s of various air arms. Now, boom refueling of American A-10s, B-1s, F-15s and F-16s from Australian and Emirati MRTTs is also being cleared. Antonio Caramazana, the Airbus head of the MRTT program, explained that the CLE imposes restrictions on the speed of the tanker-receiver formation, and on the rate of fuel transfer. Compared with a full clearance, no engineering analysis and ground testing is first completed. And in flight trials for a CLE, “we only test the center of the flight envelope, and not also the corners,” he said. However, he added. “the U.S. has a very ambitious plan for full clearance of all their receivers by mid-2016, using an Australian A330 MRTT flying out of Edwards AFB and NAS Patuxent River.” That Aussie tanker has already hooked up with an F-35A stealth fighter over Edwards. Airbus military aircraft sales head Antonio Barberan proudly noted that the MRTT has won every competition for a new tanker that it has entered. Cynics may say that the recent orders by France (12) and the European Defence Agency (EDA–three, for joint operation by the Netherlands, Norway and Poland) were from a captive market. But there’s no doubting that the Koreans (four) and Singaporeans (six) had other choices. So did India (six) and Qatar (two), other countries that have selected the A330 MRTT but are not yet under contract. Japan will acquire the rival Boeing KC-46A–Airbus DS chose not to compete there. Incidentally, France, Korea and Singapore have all opted for Rolls Royce Trent 700 engines to power their tankers. Barberan believes the worldwide market for new tankers that is accessible to Airbus amounts to 100 airframes, of which the company expects to capture 75 percent. Spain is a near-term prospect, and the EDA is trying to recruit more European nations to the joint operation, which could boost its order to eight. But although Airbus is now selling its A330neo (new engine option) version to airlines with deliveries starting in 2017, Barberan says that Airbus DS will continue to offer the A330-200 as the only basis for the MRTT until 2025. However, the latest A330 MRTT customers will all benefit from the “New Standard Programme” that results from a modified version of the A330-200 that is now being delivered from the Toulouse production line. This features an increased MTOW (242 metric tons/533,500 lbs), drag-reducing improvements to the slats and flaps, and ‘Power-8’ computers driving new avionics and displays. Airbus DS is taking advantage of the latter to develop a Tanker Integrated Mission System (TIMS) that will offer HD touchscreens; improvements to encryption and Link 16; and centralized mission data recording. Mission planning and debriefing, and monitoring from the ground, will be improved, and inflight replanning will be made possible. Aircrews will also have the ‘electronic flight bags’ that have become popular with airline pilots. The first ‘green’ A330 with these enhancements was flown from Toulouse to Getafe for the MRTT conversion last September. Also now at Getafe is the first of two Qantas A330-200s that are being converted for the Royal Australian Air Force (RAAF). The RAAF was the launch customer for the MRTT, and did not suffer the early development problems in silence. Recently, though, public comments by senior RAAF officers have been enthusiastic, and these two additional conversions will bring its fleet to seven. The RAAF is also negotiating with Airbus DS for VIP conversion kits for two of more of its MRTTs, as an alternative to buying dedicated VIP transports. A medical evacuation conversion kit for the aircraft is already available, providing up to 40 stretchers. And, of course, with all 111 metric tons of fuel carried in the wings and horizontal tail, the main deck is entirely available for passenger transport. 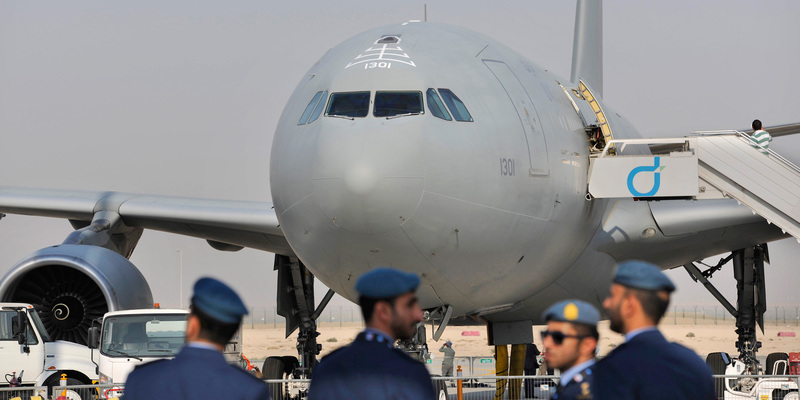 The UK Royal Air Force has already carried more than 500,000 passengers, according to Airbus. The company is also eyeing other possibilities for that big fuselage and long wings. Barberan said that customers are asking for the addition of networking and ISR payloads. Caramazana noted that some requested modifications have already been implemented, such as wideband satcom, IFF Mode 5 and ADS-B out. Then there is the Indian plan to modify two A330s as AEW aircraft. Meanwhile, Airbus DS is developing software that automatically steers the refueling boom towards the receiver aircraft’s receptacle. This could reduce risk and save time in operations, it says. The boom operator would still manage the extension and retraction of the boom. The scheme is being trialed in the simulator now, and will fly next year on the company’s A310 MRTT demonstrator, hooking up to a Portuguese F-16.